Photo Sharing Contest with Prizes, Revive Your Love! | Counseling in Pittsburgh & Monroeville, Marriage Counseling and Therapy Services. Counselors to help you achieve wellness. Counseling and Wellness Center of Pittsburgh, Therapy, Marriage Counseling, and Family Counseling. Share Your Love, Revive Your Love, Photo Contest with Prizes! Love is a mysterious and compelling source of both eternal vitality and confusion, in many ways it is humanities greatest quest since our earliest days of arboreal ascent in the vast tree limbs. The feeling of connection elicited when we share a bit of love with a long-time friend, our mother, or our lover. Love is for many a “raison de etre” and a stalwartly reason at that. Even when we are not in the midst of experiencing one of those loving moments we may be listening to, or writing a song, or perhaps creating a painting or other miraculous expression of our relationship to this divine sensation. There are so many places to see the manifestation of our hearts longing when we take the time to be present and perceive. Right there, do you see it? The elderly couple walking down the street gnarled and aching hands arthritically frozen into one pillar of hope. The mother poised with a sparkly eyed child on the park bench, it’s the man with a sole tear drop rolling from his cheek contemplating someone with aching heart. When we look to the world how much love can we see? 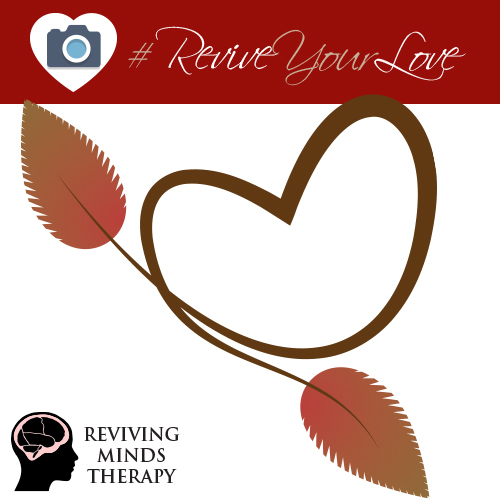 Reviving Minds Therapy would like to invite you to participate in our month long photo sharing campaign which we are calling “Revive Your Love.” We are asking participants to photograph and post an original photo which captures Love In Action to the “Revive Your Mind” Facebook or Twitter, use the hashtag “#reviveyourlove, we encourage contestants and our followers to vote by “liking” the photo that they feel most encapsulates their vision of love. All winners must have liked and followed the Revive Your Mind facebook or twitter page to be eligible for prizes. We ask that you post no more than one original photo per day, at the end of one month, the contestants photo with the most “likes” will receive 50$ Visa gift card, there will also be a 2nd place of 25$ Gift card and third place of 15$. Remember that everyone is a winner when we gaze into the world with that aim of seeing and sharing love. As always thank you for your readership and participation!